A Blog on the Landscape! : 12-10 Stove MYOG or not. 12-10 Stove MYOG or not. The 12-10 stove from Trail Designs has always had a bit of a fascination on me since i saw my first one just after they came on the market. Always one to give a MYOG a try, last week i decided to give it a go. 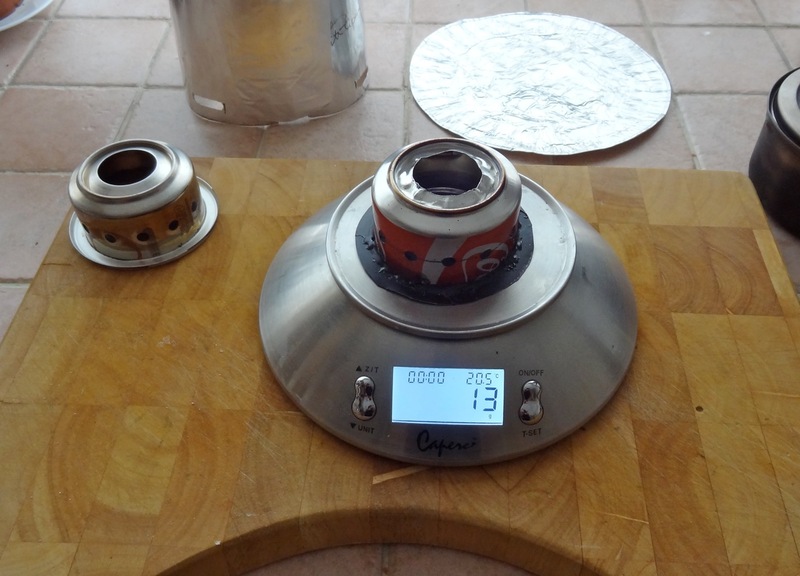 My own 12-10 stove has proved great and i much prefer it to the Whitebox type stove. You may wonder why i am giving you the conclusion first. Well the conclusion is very simple. Don’t bother making your own unless you have quite a bit of time on your hands. You can buy the 12-10 stove from Ultralightoutdoorgear for £15. Here. My 12-10 stove weighed 14 grams against the 16 grams given by Trail designs. 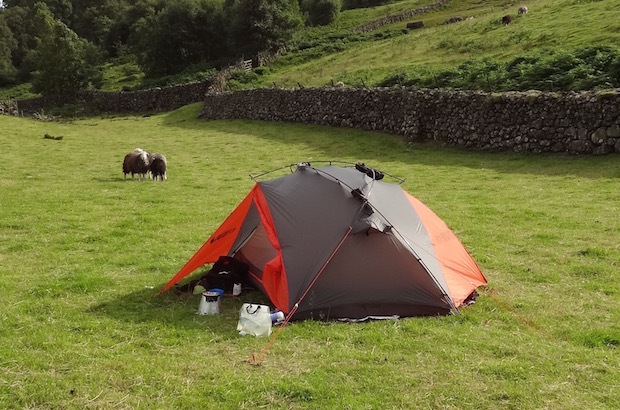 The 12-10 stove is worth every penny of your hard earned £15. It’s a lovely piece of well made kit and Trail Designs deserve the profit to work on the next one. Well done TD. I bought my 12-10 as i said a while ago and it’s made from 3 pieces of re- cycled aluminium. A “Coke” type drinks can. A “Caffeine” type energy drink can. A base plate. What the original base is made from i’m not sure. Maybe it’s formed unique but made from old cans. I’m open to be educated by anyone in the know on this. First of all, starting with the Outer skin, the coke type can. Cutting it to length and adding the holes is a simple enough job that anyone could undertake. But the central hole is a bit harder. The drinks can starts life with the base being concave. You have to re-work it to make it convex. To do this properly you need to make a double form tool, out of wood i suggest, that will give you a nice shape. Making this former takes time and i didn’t make one. I decided to cut the large diameter hole into the can first and then push the base out with my gloved hand. You need gloves because of the sharp edge of the hole. Unfortunately although a convex shape can be achieved it’s not as aesthetically pleasing as the bought one. My attempt. Weight wise it is a whole gram less than the TD one. But you can see the convex shape is a bit untidy. The inner skin, made from a caffeine type drinks can, again is easy to cut to length and add the holes. It fits loosely into the groove in the outer skin. Its not secured to the outer. The gap between the inner and outer skin is about 6mm. The inner skin provides the well for the meths and holes must be put into the inner just below the top lip to ensure that enough air provides combustion and that any excess fuel has an escape route to ground. 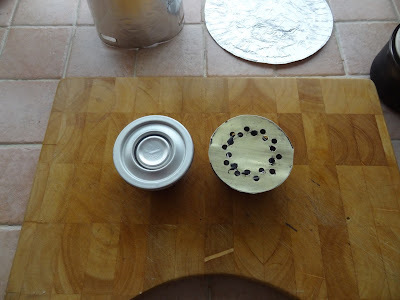 I made my base from a cut open drinks can which i flattened and cut round. I didn’t cut 1 large central hole as the original but added 2 rows of smaller holes. Functionally no different. The beautifully formed 12-10 on the left and my prototype on the right. I’m again unsure of how TD joined the outer with the base but it’s flawless and if it was liquid welded or friction welded they made a superb job. So thats the next step for me, finding liquid weld that will stand the temperature. I eventually found some in a motor accessory shop. Made in the USA. It set in 4 minutes and although i didn’t make a neat job of it, it still worked. Would it work in practice? Well i tried it first off and gave it a whole lot of space just in case it fell apart. It didn’t. It worked well. I boiled about 3 litres of water just to see if it deteriorated and it didn’t. 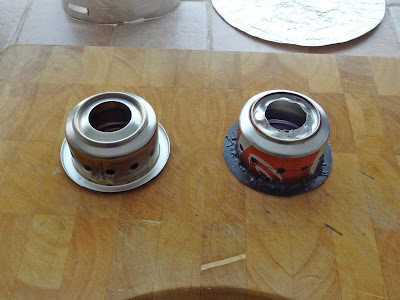 So i set about a little boil test and the results were:- 15ml of meths into both stoves. 400 ml of water into the pan. The original 12-10 stove boiled in 4 minutes 55 seconds. My attempt boiled in 4 minutes 58 seconds. Considering i didn’t measure quantities to the ‘Nth” degree i say my experiment was a success. Although aesthetically not as pleasing, it works well. But as i said at the start. Spend the £15 and buy one. Or have a go at making one and then let me know how you went on. Interesting. Did you use JB Weld? Gosh Alan, a sort of flying saucer shape! Looks good though. One cannot beat a bit of tinkering. Fascinating. Sorry Alan,it was sitting on the scales, not paying attention. Hi JJ. The weld I used was called Epoxsteel resin. It looked much like JB weld but was half the price and it states its for high temperatures. Hi Dawn, its in my DNA. I have to investigate how things are made. Phew, that's a weight of my mind. Yours may look a little 'rustic', but I'm impressed at the similarities in weight and performance. Rustic. Yes i like that. Thanks Gayle. Heck I have a old spare one you can have. Send me an address and I will post it to you. Meths stoves I like are my Flatcat designs one. No priming and superb efficient performance. So good I have gone back to meths. Thanks for the kind offer Martin. I really do have loads of meths stoves. I just like having a go at making them, simple as that. There is not too much difference between any of the numerous burners out there because meths burns at the same temperature and burns for the same amount of time. There won’t be that much difference between my best jet stove, my simple open can stove or my old Trangia in reality. The Flat Cat stove is a really nice design. Its good to see what variations folk come up with. I swop and change stoves when i go out. Sometimes i will take gas or sometimes meths, it depends on the weather i think or if i want to use up some particular fuel. I will always be a meths stove fan though. Kuiu Mountain Star 2P tent. 2015 model Review. (Short term). 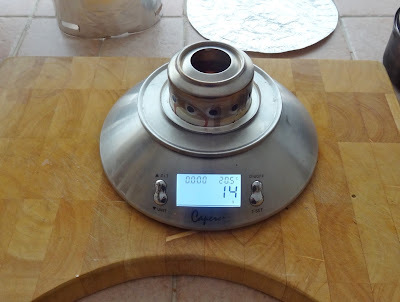 My quick stove test - for what it’s worth. MLD Duomid, Pole extender MYOG. A secret weekend Pt 3. A secret weekend Pt 2.